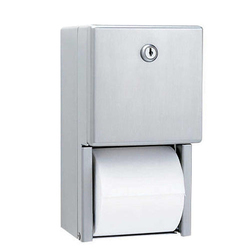 Our product range includes a wide range of paper dispenser. Uses For Kitchen, Washroom and Public Area. Our company is engaged in offering a wide range of paper dispenser, which is extensively used in hotels, restaurants and banquet halls. These are manufactured using quality raw material and keep the tissue roll in an appropriate manner and ideal for drying hand in kitchen, washroom and public area. Looking for Paper Dispenser ?